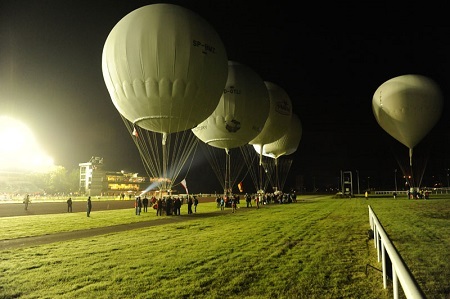 The Coupe Aéronautique Gordon Bennett, the FAI World Long Distance Gas Balloon Championship, is the oldest and most prestigious event in aviation and the ultimate challenge for the pilots. It is a story full of adventure, skill, courage, survival and luck. The goal is simple: to fly the furthest non-stop distance from the launch site. The international competition was initiated by adventurer and newspaper tycoon James Gordon Bennett Jr. in 1906. Little did he know that this race was to continue until today. 58th Coupe Aéronautique Gordon Bennett. The 59th edition is hosted in Pau, France, on the northern edge of the Pyrenees, 100 km from the Atlantic Ocean and 50km from Spain. 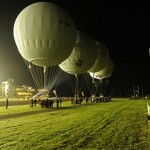 In a few days 16 teams of the world’s best gas balloon pilots representing 8 nations will compete. Given the current weather-outlook, all looks for a ”go” on Friday night around sunset at the Hippodrome of Pau. The Prize Ceremony will be held on Friday, 4 September at the Hippodrome of Pau with a spectacular Closing Ceremony to finish the event. The website www.gordonbennett.aero will provide 24/7 live tracking with all the updates on the pilot’s routes. The chatbox on that tracking page offers the opportunity for comments and encouragements for the teams while flying in European skies. The Swiss broadcaster La Télé will offer a live streaming of the launch on Friday from 22.00, and will broadcast special programmes on 27, 28, 29 and 30 August at 18.00. FAI staff are in Pau on the scene and will update the Social Media with the most important information of the prestigious event. Follow us on Instagram and on the FAI or competition Facebook pages. This entry was posted in Balloons and tagged Coupe Aéronautique Gordon Bennett, FAI, Fédération Aéronautique Internationale, gas balloon, World Long Distance Gas Balloon Championship. Bookmark the permalink.